Sharing with you another neon card with you today. I wanted to use stencil in a different way. Not sponging, no embossing paste, no spraying….. So I ventured into mixed media style. Then again I wanted my background to look bright and fresh. I picked a pattern paper with script on it, then did a light wash of gesso. Once gesso was dry, I sprayed some water first. Followed by pink neon Mr. Huey and let the colour spread around. I dried this layer and repeated another layer of pink neon. Followed by a mix of green and yellow neon Mr. Huey. Again let it dry. Once dry, I spattered some black Mr. Huey. At this stage, I am loving the fresh colourful look. Now I took the Patina stencil from Penny Black, placed it on the pattern paper randomly and just drew the outline of the flower petal with a black sharpie. I went with rules of third. 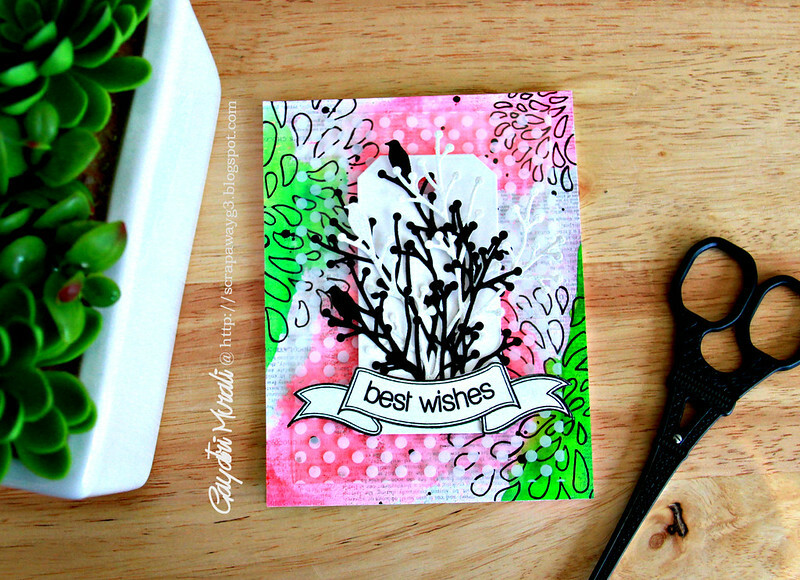 I love the black outline of the flowers layered on the pink and green neon colour wash. This became the background for my card. I like with the printed acetate sheet from We’re Memory Keepers. This one I have used to layer is white polka dots. This layer tones down the bright neon colours. I then added a white tag. 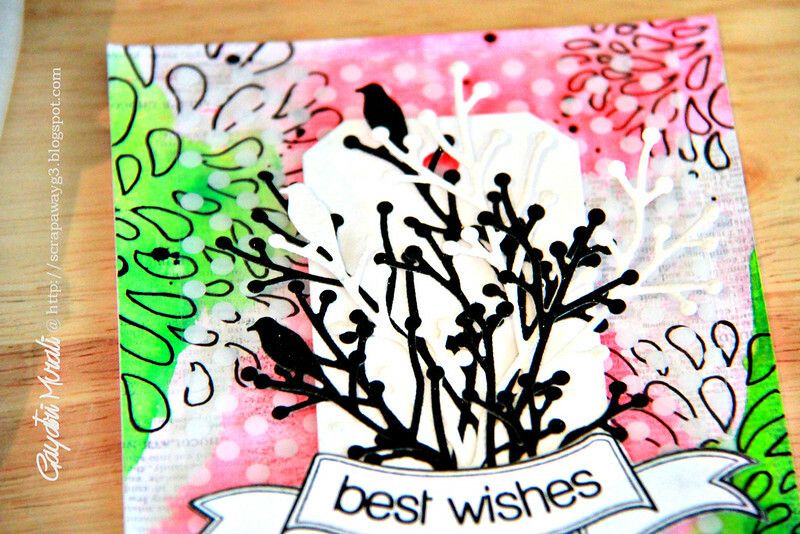 On the tag, I layered die cuts from Penny Black die called Nature’s Song in black and white glitter paper. Finally the sentiment is from Come Rain or Shine stamp set also from Penny Black. I absolutely love the background. Simple to do and makes an impact. Beautiful inspiration piece, Gayatri. I must try this! very impactful Gayatri. The colours are simily gorgeous and just love the outlined flowers done like that.